Summary: Great weekend. Slight chance of rain Sunday. Rain returns all next week. Yesterday was great, today will be even better. Today we will see no clouds in the sky as our high temp will reach a nice 72 degrees. Our winds will still be out of the NNE at about 5 mph. There is no chance of rain today. Saturday night our temperature will fall to a brisk 46 degrees. Sunday a few clouds make their way into the skies, but nothing to worry about. Our temp will be a bit warmer at about 81 degrees. Winds will start coming out of the south which will bring in moist air. There is a small chance of rain Sunday as a disturbance brings rain to our southern neighbor states. This is a slight chance. Monday is a complete soaker. Expect Monday to be a washout as showers and storms blanket us for most of the day. Our high temperature will be around 70 degrees with a virtual 100% chance we will get wet. 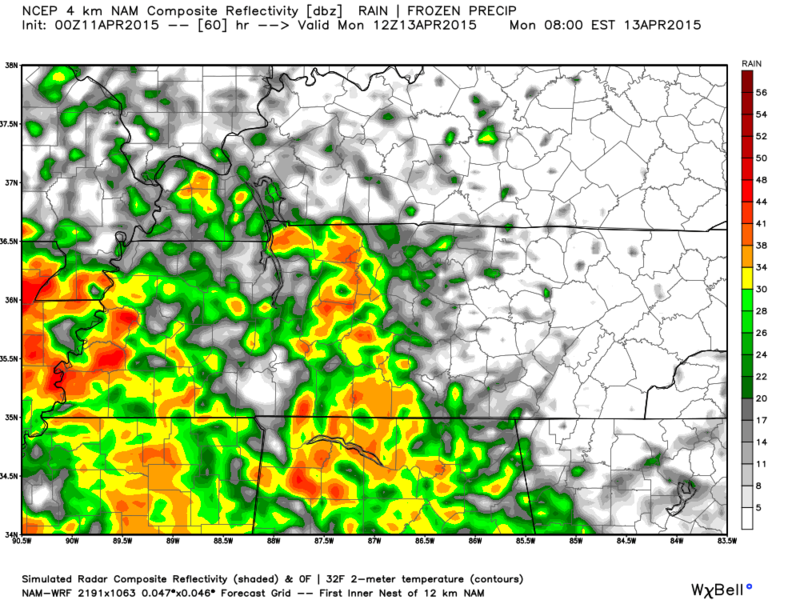 Latest NAM4 shows rain really covering us bright and early at around 7am Monday morning. The rest of the week sees rain chances every day. Wish I could detail exactly what the rain chances are, but weather.gov is having some issues with their forecasts. From looking at other reliable weather sources, rain chances remain throughout the week, where only Tuesday we may see a break. Next weekend is looking mighty fine again. If forecasts hold up, we will see low 70s for temps and sunny skies next weekend as well. We don’t like the rain, but these perfect weekends back-to-back-to-back …. we could get used to.